Keeping your kids entertained in the pool is no easy feat, especially if you want to relax in the sun with a book and they’re intent on having fun. The good news is, a small addition to your pool will provide hours of entertainment, massively increasing the fun your kids (and you) can have in the pool. In this article, I’ll explain everything you need to know before buying a pool slide, so you can make the right decision, and get the best pool slide for your pool. We hand-picked the following pressure-side pool cleaners based on their popularity, price-points and differentiating features. 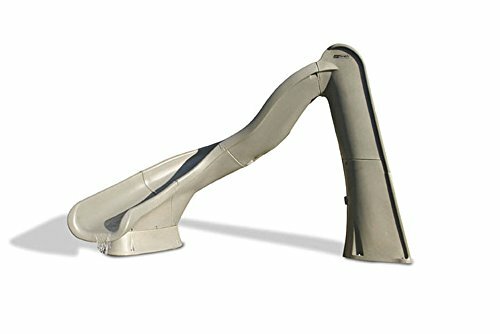 What Types of Pool Slides Can You Buy? Straight leg slides feature a straight section at the top, with a broad curve at the end where it sends a slider right into your swimming pool. You’ll find straight leg slides anywhere from 8 to 12 feet tall, with a set of stairs to climb that is mainly just a ladder. The stairs for these types of slides can be either open or closed, and fit well with smaller swimming pools because of their simple shape. If you’re looking for a slide and have smaller children, a closed set of stairs is much safer, as they stop feet from slipping through. 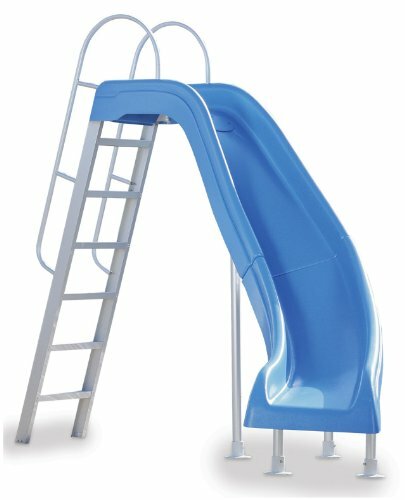 Molded leg slides typically feature a larger curve and a steeper design than the straight leg counterparts, which adds to the thrill your children will get using this particular slide. You’ll find molded leg slides usually around 8 feet tall, with an enclosed staircase for added safety. Because it’s closed, your feet cannot slip through and off each step. Owing to their compact design, molded leg slides are great options for pool owners looking for a slide that doesn’t take up a large amount of deck space. Elephant leg slides are the largest and fastest of the different types of pool slides, with models reaching up to 14 feet tall. 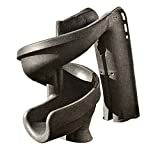 These types of slides are immediately identifiable, owing to the unique “elephant feet” staircase you use to reach the top of the slide. You have the choice between two different styles with this design; a G-Force pattern that is a massive 360 helix, and the stream design that curves and twists. Straight vs. Molded vs. Elephant: Which is Best? Straight leg slides are the most basic option, ideal if you’re looking for a simple slide and only have a smaller pool that isn’t particularly deep. Molded leg slides are steeper with a more compact design, perfect if you have a limited amount of deck space and want a fun yet thrilling slide. Elephant leg slides are the largest of the group and are best suited for families with older kids who are looking for the most thrill and excitement as they slide. Overall, my recommendation would be to invest in a molded leg slide, they offer a thrilling ride without taking up a large amount of deck space. Let’s go over some of the main criteria you should apply to your decision making process when looking for the perfect pool slide. Is It a Suitable Size & Shape? Before choosing a particular slide it’s essential to consider the footprint, that is, just how much space it’s going to take up on your deck once it’s installed. Larger slides are more fun of course, but the bigger the slide, the more ground area you lose to install it alongside your pool. I’d also recommend considering the positioning, as you don’t want to be stuck with a giant slide in the middle of your deck, that breaks up the flow as you walk around your pool. Is It Compatible With Your Pool? Not all pool slides will be compatible with your swimming pool. Most pool slides require installation onto a wooden or concrete deck, so they are fixed in place and are stable and secure for your family to use. Because of this, you need to make sure you’ve got an appropriate place to set up your slide. Will It Need A Water Supply? To help sliders speed down the flume, many slides can connect a flowing water supply, either through a garden hose connection or your pools return line. The benefits of having a water supply reduces traction so you can slide faster, while also minimizing the chances for any grazes or abrasions as you slide. The running water also turns your slide into a beautiful water feature, enhancing the overall appeal of your pool. Of course, the bigger the pool slide, the more cumbersome it is to maneuver into place and install it successfully. Some models are even quite heavy in the box, so this needs to be considered before you buy. Generally, you’re going to need at least 2 people to install a pool slide successfully and make sure the product you buy has explicit instruction videos. It can take anywhere from 1 hour to several to set it up, depending on the particular model you buy. The quality of a particular pool slide depends on what it has been constructed from. The earlier models you probably know as a kid were either fiberglass or acrylic, but these days most slides are made from polyethylene. Polyethylene is essentially very heavy-duty plastic, which makes it capable of standing up to the harsh rays of the sun, has some flex to avoid cracking, and is overall a highly durable product. Assuming you’re not on a super tight budget, most pool slides should last several seasons. So far we’ve covered why you should get a pool slide, the different types available and what features are important to focus on. 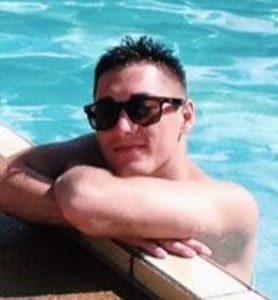 In this section, we’ll be looking at specific swimming pool slides, each of which were hand-picked for review based on the same criteria I’ve outlined in this guide. Designed by S.R. 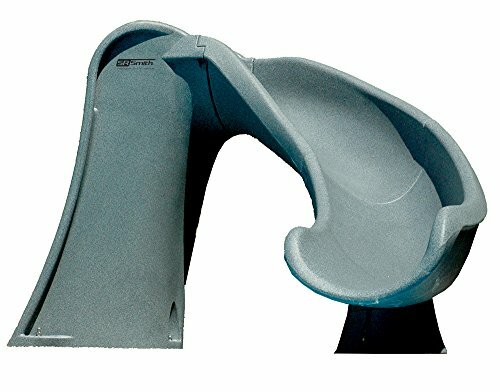 Smith, this is a 7’4″ tall molded leg slide, able to accommodate both adults and children up to 275 pounds. Featuring a sturdy rotomolded polyethylene construction for strength and durability, the slide offers a water flow of 20 GPM that connects into a garden hose, or your pools return system to give you a fast and fun slide. What I like best is the lack of exposed metal which ensures it’s a perfect slide for both chlorine and salt-water pools, and the enclosed ladder to prevent your kids’ feet slipping through as they climb. The biggest downside is the installation can be tricky as the pre-drilled holes don’t align, and the steps have a little too much “give” in them. This is my runner up for the best pool slide. Designed by S.R. 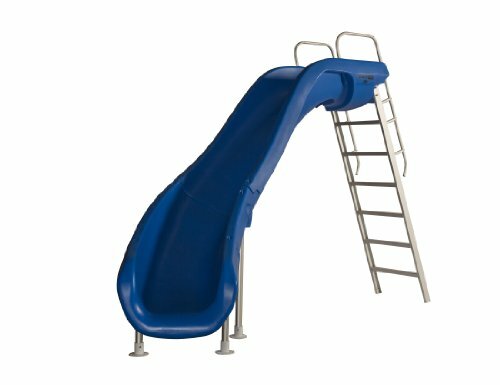 Smith, this is a retro-looking 7′ tall, straight leg slide, able to accommodate both adults and children up to 250 pounds. Featuring a high-volume water delivery system (30 GPM), the wide and deep polyethylene flume helps create the perfect balance of speed and safety for all slide users. The aluminum steps are sturdy and include a safety rail as you climb. What I like best is the durability. It’s quite a massive slide that you can trust will last you season after season, built from the highest quality products. The biggest downside is the installation, it will take you a few hours to set this slide up, you can’t do it alone. This is my top pick for the best pool slide. Designed by S.R. 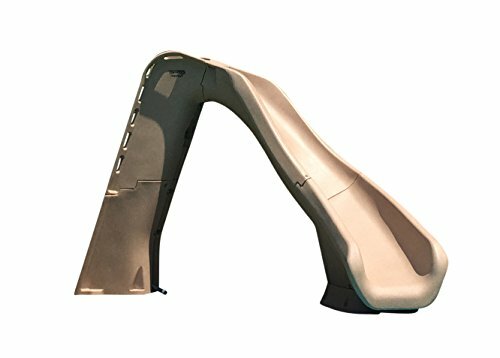 Smith, this is an 8’7″ tall molded leg slide, able to accommodate both adults and children up to 275 pounds for a fast and thrilling slide. Featuring a high-powered water delivery system that flows at 25 GPM, it’s a sturdy yet safe design made from polyethylene, with curves and dips for hours of family fun. What I like best is the quality, this slide will last several seasons and provide a speedy slide. The only downsides are this can be a little too overwhelming for small children, and you need to be careful of the bump that forms in the flume from the connecting pieces. Designed by S.R. Smith, this is a 4’1″ tall molded leg slide, able to accommodate sliders up to 175 pounds, and comes backed with a 3-year warranty. Featuring an elegant rotomolded design crafted from high-quality polyethylene, you have a choice of three different colors to best match your existing pool deck. What I like best is the wide flume that ensures everyone using the slide exits safely, and the enclosed ladder helps prevent slips and falls as you climb. The biggest downside is the lack of installation instructions, and that it’s not an actual water slide which means you may get stuck or not slide as fast as some of the other slide options. Designed by Inter-Fab, this is a 6′ tall, straight leg slide, able to accommodate sliders up to 225 pounds, and is available in four different colors to best match your home and deck. Featuring an easy to connect the water supply to either a garden hose with an adapter or your pools return system, you can choose either a left or right curve in the slide. The aluminum ladder is sturdy, while the slide is crafted from long-lasting acrylic. What I like best is the deep runway with high edges to help keep sliders in the slide, and the sturdy aluminum ladder for climbing up. The biggest downside is the quality, some users have found the slide cracks easily, and if you’re mounting to a deck, you will need to buy the mounting flanges separately. Designed by S.R. Smith, this is a 7’4″ tall molded leg slide, able to accommodate sliders up to 250 pounds, while only taking up a 5′ by 9′ amount of deck space. Featuring a 360-degree twist in the slide, the patented water fountain helps improve water delivery to ensure a safe and fun slide, and also make it a beautiful water feature. What I like best is the enclosed ladder and handrails help prevent falls and slips, and you can even use this slide in salt water pools. The only downside is the installation, it takes about an hour to set up and install, and if you’ve got older kids, the turns can be too tight for them to slide down effectively. Investing in a slide for your pool is a smart decision. Not only does it add a pleasing aesthetic to your pool, but there’s also nothing more fun on a hot summer’s day for your family to enjoy.